Plastic waste has no place being in the ocean. Environmentalists are upset about the problem of that trash, but they have a problem of their own: the trash, and in particular the famed "Gyres" aren't readily visible to the human eye (or even satellites, but more about that in a minute). 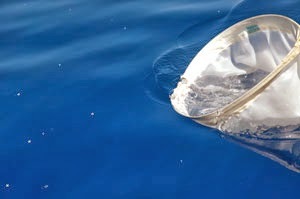 A photo such as this one on the right, taken by Scripps Institute researchers, shows what plastic in a gyre looks like. There aren't large items in the gyres, just mostly tiny specks of plastic and that's just not going to get most people worked up about the problem. Calling it a thin soup of plastic is accurate but not inflammatory. So instead, other pictures and even image-evoking words are used to describe the problem. 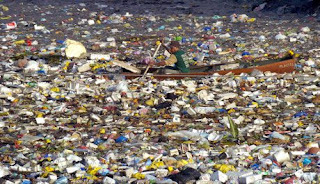 Instead of "gyres", terms such as "garbage patch" or "islands" are used, and somehow this photo (taken in Manila Bay, not a gyre) is commonly used. Looking at this heap of trash gets people way more upset about the problem even if it isn't a true representation. And then there are the environmentalists that are opportunistic and take advantage of working their issue into the news of the day, in this particular case, the missing Malaysian airliner. CNN had a headline last week, "Plane search hampered by ocean garbage problem". By the third short paragraph, the article is already quoting environmentalists:"'It isn't like looking for a needle in a haystack,' Conservation International senior scientist M. Sanjayan said of the difficulty in finding the Boeing 777 aircraft. 'It's like looking for a needle in a needle factory. It is one piece of debris among billions floating in the ocean.'" Somehow I think the difference in size between billions of specks of plastic and debris from a crash size can be easily discerned, especially since the latter can potentially be seen in satellite imagery and the former can't. Sadly, this is not the first time that environmentalists have used a plane crash to advance their cause. In 2009 when an Air France jet disappeared on a flight over the Atlantic, environmentalists were again pushing their cause. "...Brazilian officials said what they had found was nothing more than run-of-the-mill ocean trash. This highlights a little-seen environmental problem: Scientists say the world's oceans are increasingly filled with junk -- everything from large items like refrigerators and abandoned yachts to small stuff like plastic bottles." While I find it fairly appalling that the disappearance of a jet over the ocean is being used to leverage one's political position insteading of recognizing the human tragedy that it is, I accept that many people do not. But the inaccuracy of these articles continues to propagate the false imagery that the oceans are filled with large pieces of plastic waste. And that is just not true. March 25, 2010 - What Are The Odds?